The dsp.CoupledAllpassFilter object implements a coupled allpass filter structure composed of two allpass filters connected in parallel. Each allpass branch can contain multiple sections. The overall filter output is computed by adding the output of the two respective branches. An optional second output can also be returned, which is power complementary to the first. For example, from the frequency domain perspective, if the first output implements a lowpass filter, the second output implements the power complementary highpass filter. For real signals, the power complementary output is computed by subtracting the output of the second branch from the first. dsp.CoupledAllpassFilter supports double- and single-precision floating point and allows you to choose between different realization structures. This System object™ also supports complex coefficients, multichannel variable length input, and tunable filter coefficient values. Create the dsp.CoupledAllpassFilter object and set its properties. caf = dsp.CoupledAllpassFilter returns a coupled allpass filter System object, caf, that filters each channel of the input signal independently. The coupled allpass filter uses the default inner structures and coefficients. caf = dsp.CoupledAllpassFilter(AllpassCoeffs1,AllpassCoeffs2) returns a coupled allpass filter System object, caf, with Structure set to 'Minimum multiplier', AllpassCoefficients1 set to AllpassCoeffs1, and AllpassCoefficients2 set to AllpassCoeffs2. caf = dsp.CoupledAllpassFilter(struc,AllpassCoeffs1,AllpassCoeffs2) returns a coupled allpass filter System object, caf, with Structure set to struc and the relevant coefficients set to AllpassCoeffs1 and AllpassCoeffs2. struc can be 'Minimum multiplier' | 'Wave Digital Filter' | 'Lattice'. caf = dsp.CoupledAllpassFilter(Name,Value) returns a Coupled allpass filter System object, caf, with each property set to the specified value. Specify the internal structure of allpass branches as one of 'Minimum multiplier', 'Wave Digital Filter', or 'Lattice'. Each structure uses a different pair of coefficient values, independently stored in the relevant object property. Specify the polynomial filter coefficients for the first allpass branch. This property can accept values either in the form of a row vector (single-section configuration) or a cell array with as many cells as filter sections. This property is applicable only if you set the Structure property to 'Minimum multiplier'. Specify the Wave Digital Filter coefficients for the first allpass branch. This property can accept values either in the form of a row vector (single-section configuration) or a cell array with as many cells as filter sections. This property is applicable only if you set the Structure property to 'Wave Digital Filter'. Specify the allpass lattice coefficients for the first allpass branch. This property can accept values either in the form of a row vector (single-section configuration) or a cell array with as many cells as filter sections. This property is applicable only if you set the Structure property to 'Lattice'. Integer number of the delay taps in the top branch, specified as a positive integer scalar. This property is applicable only if you set the PureDelayBranch property to true. Gain1 is the individual branch phase gain. This property can accept only values equal to '1', '–1', '0+i', or '0–i'. This property is nontunable. Specify the polynomial filter coefficients for the second allpass branch. This property can accept values either in the form of a row vector (single-section configuration) or a cell array with as many cells as filter sections. Specify the Wave Digital Filter coefficients for the second allpass branch. This property can accept values either in the form of a row vector (single-section configuration) or a cell array with as many cells as filter sections. Specify the allpass lattice coefficients for the second allpass branch. This property can accept values either in the form of a row vector (single-section configuration) or a cell array with as many cells as filter sections. 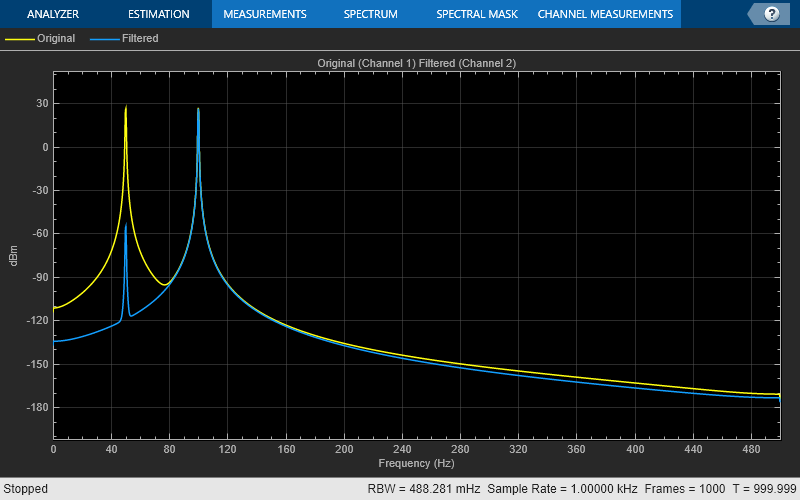 Specify the value of the independent phase gain applied to branch 2. This property can accept only values equal to '1', '–1', '0+i', or '0–i'. This property is nontunable. Specify the value of the phasor gain in complex conjugate form, in each of the two branches, and in complex coefficient configuration. The absolute value of this property should be 1 and its default value is 1. This property is applicable only when the selected Structure property supports complex coefficients. This property is only enabled if the currently selected structure supports complex coefficients. Use it only if the filter coefficients are actually complex. y = caf(x) filters the input signal x to produce the output y. When x is a matrix, each column is filtered independently as a separate channel over time. [y,ypc] = caf(x) also returns ypc, the power complementary signal to the primary output y.
Lowpass filtered output, returned as a vector or a matrix. The size and data type of the output signal matches that of the input signal. Power complimentary highpass filtered output, returned as a vector or a matrix. The size and data type of the output signal matches that of the input signal. Realize a Butterworth lowpass filter of order 3. Use a coupled allpass structure with inner minimum multiplier structure. 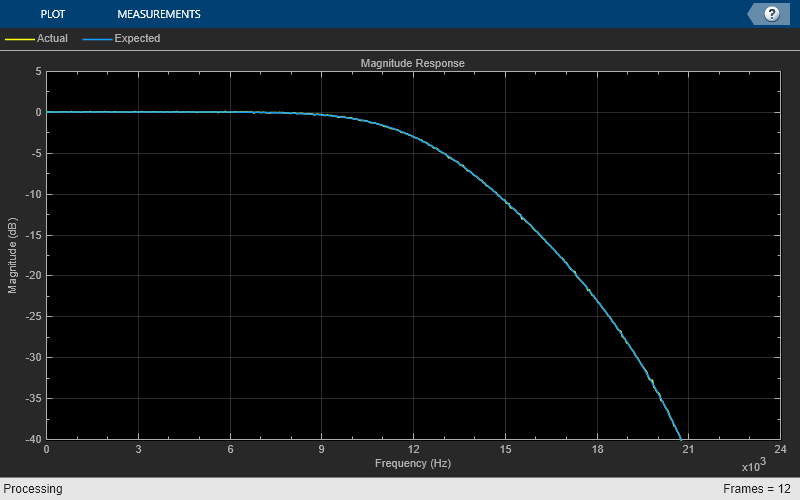 Remove a low-frequency sinusoid using an elliptic highpass filter design implemented through a coupled allpass structure. 'SamplesPerFrame',frameLength); % Input composed of two sinusoids. 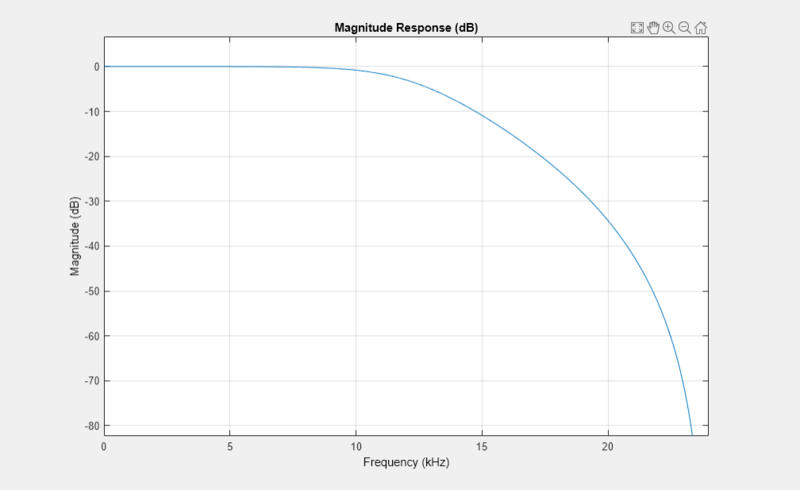 Design a Butterworth lowpass filter of order 3. Use a coupled allpass structure with inner minimum multiplier structure. Using the 'SubbandView' option of the dsp.CoupledAllpassFilter, you can visualize the lowpass filter output, the power complementary highpass filter output, or both using the fvtool. To view the lowpass filter output, set 'SubbandView' to 1. To view the highpass filter output, set 'SubbandView' to 2. To view both the outputs, set 'SubbandView' to 'all', [1 2] or [1;2]. The following three figures summarize the main structures supported by dsp.CoupledAllpassFilter. Regalia, Philip A., Mitra, Sanjit K., and P.P Vaidyanathan “ The Digital All-Pass Filter: A Versatile Signal Processing Building Block.” Proceedings of the IEEE 1988, Vol. 76, No. 1, pp. 19–37. Mitra, Sanjit K., and James F. Kaiser, "Handbook for Digital Signal Processing" New York: John Wiley & Sons, 1993.